October 20-24th, 2015, marked the first ever FAI World Championships for indoor skydiving. 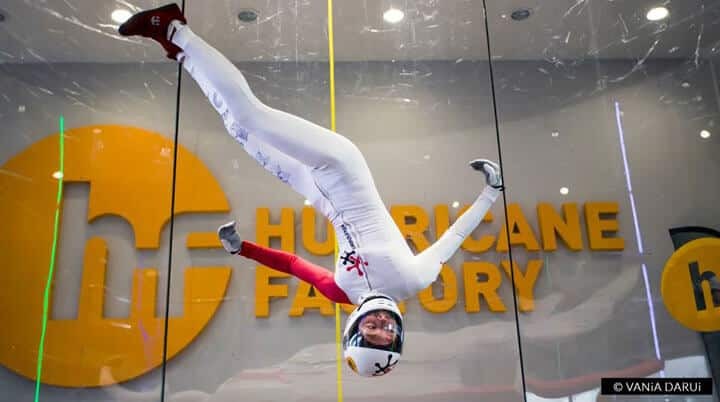 This historical competition was hosted at the Hurricane Factory Prague wind tunnel located in the Czech Republic. Competitors traveled from all parts of the world to compete for gold, and the first ever indoor skydiving ‘World Champion’ title. These athletes were motivated and inspired by their love of flight. Years of dedication and focus are required to reach the level of top competitive indoor skydiving athletes. The WISC 2015 consisted of six varying disciplines with ten categories including: FS4, FS4 Female, VFS4, Freestyle, D4W, and D2W. In the end, the top competitors from around the world were awarded a gold medal and the title of the first ever FAI Indoor Skydiving World Champion. Inka Tiitto was amongst those champions. Her grace and talented flying abilities during the freestyle competition have gone noticed throughout the indoor skydiving community and general public alike. Inka Tiitto is originally from Finland and is currently a resident of the World. She first stepped into a wind tunnel in October of 2011. Now, almost exactly four years later, she has flown in over twenty tunnels across the world, competed in five separate indoor skydiving competitions, and is known as the first ever Indoor Skydiving World Champion in Freestyle! Freestyle is a solo discipline that consists of compulsories and individual creative routines. These routines showcase the flyer’s skills within the tunnel, and are designed to wow the audience with a precise and cohesive display of ability and artistic creativity. These routines are timed and subjectively scored by a number of competently trained judges. Indoor Skydiving Source had the privilege to interview Inka about her win, and get to know her as a talented and accomplished tunnel flyer and coach. ISS: When did you first start flying in the tunnel and how were you introduced to the world of indoor skydiving? ISS: How does it feel when you are flying? INKA: I love the feeling of freedom and flow when I am flying. It feels like dancing. ISS: Who has been the most influential person for your flying and what inspires you to stay motivated? INKA: I have met soooo many inspiring flyers during the past few years, travelling around the world flying, and I have tried to be open to different styles I see, take what I like and make it fit my own style. My main coach has been Ty Baird who has done an amazing job in pushing me past so many limits I thought I had. Ty is a super innovative and creative flyer and his way of looking at flying keeps inspiring me on my journey to dance in the tunnel. I am also so inspired by all the unexplored opportunities and challenges in flying and the fact that you are never ready - there is always something new to learn or try. That’s what keeps me motivated. ISS: How many hours do you currently have in the tunnel? INKA: Around 1500 hours, which includes all of my flying, coaching as well. ISS: Do you or have you ever worked for a tunnel as an employee? INKA: I never worked for a tunnel, and I am not a tunnel instructor either, so I never got to benefit from staff time ;) To get where I am now required a lot of hard work and a big leap of faith. ISS: Do you think it is harder for women to progress in the sport vs men? INKA: We are talking about a sport where our main tool is our body and for sure, male and female bodies are different, but nothing says one is better than the other. I see being a girl as an asset, not as something that would hold me back. ISS: If you had to give a new tunnel flyer who is just starting out one piece of advice what would it be? INKA: Remember to have fun. Flying is a wonderful thing to experience and no matter what your goals are or how hard you want to push yourself, you should be able to enjoy the journey. ISS: What is your absolute favorite maneuver to do in the tunnel? ISS: What other outlets contribute to your success in flying? INKA: I am not only flying - I am trying to do more and more yoga and go back to dancing and pole dancing to get some inspiration and new skills to support my flying. ISS: How many tunnels across the world have you flown in? ...hmm. I think that’s all. In a few months I am heading to check out the tunnels in Singapore and Sydney too! ISS: How many competitions have you competed in? Which one was the most memorable/your favorite? INKA: I have participated in D2W twice, first with Karine Joly in Charlewars 2014 and then with Louise Kristensen in the Wind Games 2015. I also did D4W twice with Sirius Fly, in Charlewars and Extreme Barcelona. By far the most memorable competition however is the World Championships in Prague. I loved flying freestyle, it was awesome to perform to the audience there, compete against my friends and walk out with a gold medal in my pocket! ISS: What was the hardest maneuver for you to master? INKA: Fliptwist. I must have tried every possible way of doing it wrong at it ended up being one of the rare maneuvers that I was scared of practicing because I could not figure it out...but I forced myself to fly it in my competition routine so I had to push through my fears. I am playing with them now and getting more confident every tunnel session. ISS: When coaching, how do you connect with your students? INKA: I love teaching people because it is so challenging - every student is different and it is my job to figure out what makes them progress the fastest while having fun at the same time. Understanding how to fly is just a minor part of the job, it is way more about reading people, communicating and connecting with them and finding a way to motivate them. ISS: What is your approach in coaching? INKA: Nobody flies perfect and even all the top flyers and coaches in the world are still learning, so the best is always if students learn why things are happening the way they are during a move instead of a strict, fixed way of flying each move. This is how I can push people towards having a skillset and understanding that can change the sport in the future. ISS: Who are your sponsors? INKA: I have been in the Turbolenza team for two years now and they have been supporting me both in the tunnel and in the sky. Deem Flywear is spoiling me with their amazing suits, I get helmets from Skyhelmets, Flyspot supports my competition training, Larsen and Brusgaard has given me more support than I could ever wish for and I am also sponsored by UPT and NZ Aerosports. ISS: What are your current flying/coaching goals? ISS: Where/when is your next tunnel camp? INKA: I have a lot of camps coming up, you can check my schedule from my athlete page on Facebook if you are interested in flying with me! :) I coach a lot at Flyspot in Warsaw but I am also doing some trips to FlyIn in Liege, Tatralandia in Slovakia, Flystation in St.Petersburg, Gravity in Bahrain, iFly Singapore, Inflight Dubai and iFly Downunder in Sydney during the spring. ISS: What were your thoughts before each round in the competition? INKA: I used to be really nervous when I was performing or competing during my dancing years, so I was really expecting I am gonna be terrified...but I was just super excited to fly. The audience and all the friends watching gave me a lot of good energy and flying was fun. ISS: Going into the World Championships, who did you think was going to be your biggest competitor? INKA: Dave Reader, for an obvious reason, he is a really strong, technical flyer and makes all of that always look smooth and easy. I knew from the beginning of my training that he is participating as well and it made me push myself a lot because I knew it’s gonna be a tough competition. ISS: What was the competition like behind the scenes? INKA: Great atmosphere. Freestyle was a fun battle between a lot of friends and everyone was supporting and helping each other out. ISS: What does freestyle mean to you, and why did you choose this discipline over all the others? INKA: I am pretty sure I would fly like this even though such a discipline as freestyle would not even exist. I started dancing when I was three years old and before I started working as a tunnel coach, I was a dancer, dance teacher and choreographer. I just want to dance in the wind and that happens to fit under the freestyle discipline pretty nicely! ISS: Tell us what happened following your win. INKA: I have had a lot of people contacting me from outside our sport, looking for performers for music videos, tv, movies...this is a great opportunity to take our sport to the next level and I am doing my best to seize the moment here and be a part of as many of these projects as I can. ISS: Where/when is your next competition going to be? INKA: I am gonna start training for Charlewars 2 in January. I am super excited to try out all the new ideas and create a new routine. Inka Tiitto undoubtedly has a bright future ahead of her. Flyers from around the world respect and admire her flying and coaching skills. In addition, she has become an icon and role model for female flyers across the world. This is just the beginning of Ms.Tiitto’s flying and competitive journey. We look forward to watching her progress through this sport even further as she continues to set the standard. You can get in touch with Inka through her coach profile here on ISS.